Greece and its powerful Orthodox Church tentatively agreed on Tuesday to remove some 10,000 priests and auxiliary staff from the State payroll, in a deal that could pave the way for a clearer distinction between church and State. The Greek Orthodox Church has played a leading role in the life of the country for many centuries and is considered its official religion under the constitution. For many Greeks, their national identity is intricately bound up with their religion. Under the deal, reached between Greek Prime Minister Alexis Tsipras and Archbishop Ieronymos of the Church of Greece, the state will in the future transfer an annual state subsidy to a special church fund for the payment of priests’ salaries. The agreement also foresees a settlement to a decades-old dispute over property between the Greek state and the Church, which is one of the country’s largest real estate owners. Greece’s creditors have long urged the government to sell assets and reduce the number of public sector employees. Under the current system, priests’ salaries are paid directly from the State budget as are those of all civil servants. The annual cost of the priests on the government’s payroll is estimated at about 200 million euros. Tuesday’s agreement must still be approved by the cabinet, Parliament and church leaders. A group representing priests said they would resist any attempt to strip them of their status as civil servants. “We will struggle to ensure the present status is maintained,” Father Georgios Sellis, head of the association of Greek priests, told the Proto Thema news website. Tuesday’s preliminary agreement coincides with parliamentary discussions on a revision of Greece’s constitution. 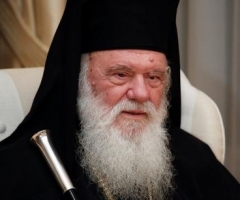 Tsipras said he had reassured the Archbishop that any constitutional changes would protect the autonomy of the Church.